Below I've tried to transcribe as best I can the attached image from my grandfathers polish military ID book, but there are a few words that are smudged and make reading and translating difficult. I was hoping someone could make out the context and figure what those words were (marked by " illegible"). Nr. 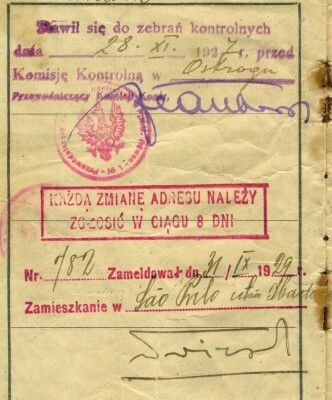 782 Zameldował dn 31/IX 1929r. No. 782 reported on 31 Setember 1929. Przewodniczący Komisji Kontrolnej w P.K.W. Równo Nr 1. Każdą zmianę adresu należy zgłosić w ciągu 8 dni. Nr. 782 Zameldował dn. 31.IX.1929r. No. 782 registered (his address) on 31 Setember 1929. Living in Sao Paulo ?? ?ictao Ibade?? 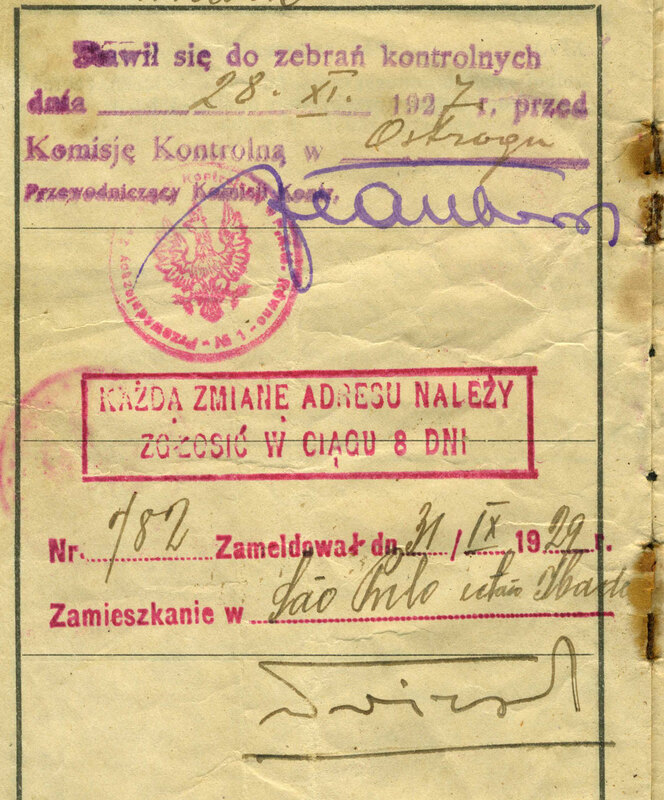 He registered his living place (Sao Paulo) in Ostróg, https://pl.wikipedia.org/wiki/Ostr%C3%B3g = powiat Równo Ostróg – miasto na Ukrainie. He must be tied to this town somehow. It was his parish or birth place or polish living place. P.K.W. - this must be Państwowa Komisja Wojskowa, National Military Comission, they issued some king of Registy card. Cannot find more info on internet. Earlier in the document he lists his polish address as Lucyrn, a small village southwest of Ostroh, just on the outskirts. If I'm not mistaken, it was a border town with Russia during the interwar period. He emigrated to Sao Paulo, Brasil in 1929, starting to get paperwork as early as April, departed to Southampton in May but only arrived in Sao Paulo in September. It's remarkable that he was able to correctly estimate his arrival time in Sao Paulo, considering how long it took him to get there... Unless he got the stamp at some Polish embassy in Sao Paulo? Seems unlikely.